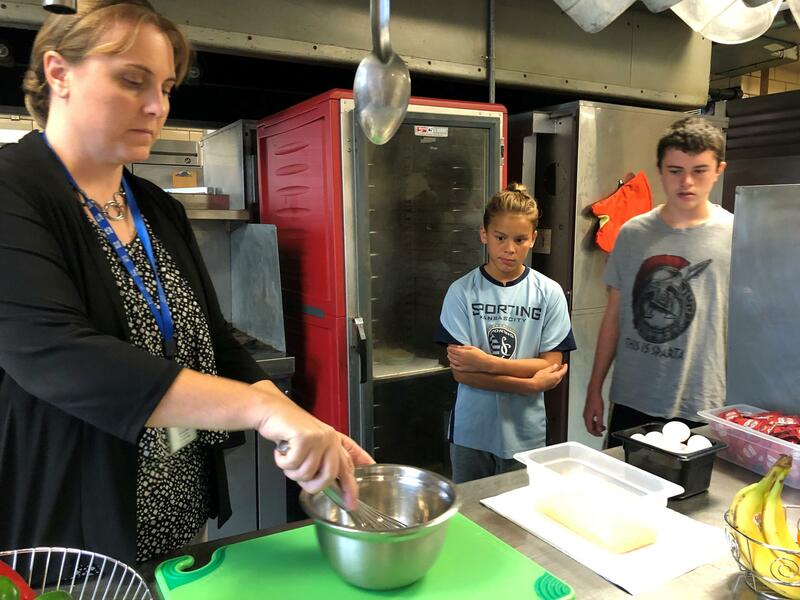 Two seventh grade students at Center Middle School watch as cooks scramble eggs for protein-rich breakfasts. The Center School District is participating in a Purdue University research study to see if serving middle school students more protein in the morning improves their focus and attention throughout the day. Center is the first school district in the nation to introduce protein-rich breakfasts, says Kruse. Middle school students will get them this year. “As a registered dietitian, I’m looking at the school meals and what’s in a breakfast, and that’s really regulated by how we’re reimbursed. But those components don’t include a protein source. Meanwhile I’m telling my own kids every morning, choose a protein, choose some colors, I want you to have a good, healthy breakfast. Why aren’t we feeding the same thing to our students?” Kruse says. The United States Food and Drug Administration reimburses schools if they serve meals that meet certain guidelines. According to the USDA, the components of a healthy breakfast are fruit, milk and whole grains. But Center students weren’t taking the reimbursable breakfast. Even though 87 percent of students in the district qualify for free or reduced-price lunch, only about a third of them were eating breakfast every morning. So when the Center Education Association asked the district to apply for a Breakfast in the Classroom grant, Nibbelink was on board. That way kids wouldn’t have to go to the cafeteria to get their breakfasts. Center got the grant, which provided $100 per student in the district to buy the necessary equipment – everything from skillets to refrigerators to grab-and-go kiosks to extra custodial staff to clean up after kids eating in their classrooms. Kruse pushed for protein-rich breakfasts after hearing from Purdue researchers at a conference. Three times a day, Center Middle School students will be asked to take a 10-second survey rating their mood and energy to figure out if the protein-rich breakfasts are making a difference. Funding from the Egg Nutrition Center helped make the project a reality. Students who watched a cooking demonstration Tuesday thought the new breakfasts looked tasty. “I’m looking forward to the egg muffin because last year the eggs didn’t have the pepper and all that stuff in them,” says seventh grader Jordan Hurst. 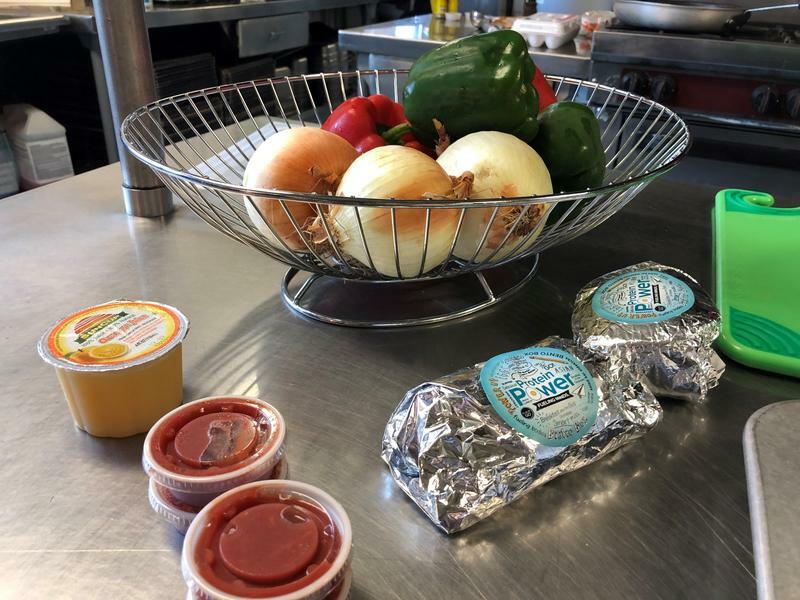 Center Middle School will also serve breakfast sandwiches on English muffins and breakfast burritos.